Temple Hillel B'nai Torah has an active Family Education Program which is a wonderful time for parents and children to share together, and for families to get to know our Rabbi and learn together as a class community. Each kitah/class has at least one Family Education program scheduled per school year. We encourage both parents to attend all Family Education Programs. Each child should have at least one adult to be with them at each program and to accompany them on field trips. Grandparents or others may attend should a parent be unavailable. 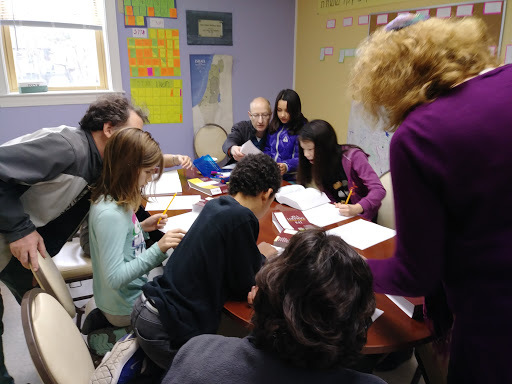 For an example of family learning with our Chaverim School students and families click HERE. Blowing the shofar is a blast! We also have many events during the course of the year geared towards Families with Young Children (ages 0-6). To find out about all of the events for Families with Young Children (FwYC), please sign up to receive our emails, check the Temple calendar, email FWYC@templehbt.org, and/or join the Facebook Group. One Friday a month we have Shakin' Shabbat, which is a half-hour service geared towards children under 5, followed by either a pizza dinner or our synagogue-wide community dinner. Children are encouraged to participate in the service, which is led by Rabbi Penzner during the school year and lay-led during the summer. The pizza dinners are a wonderful time for the parents to connect and the children to play. Check the calendar for the next Shakin' Shabbat date. During the school year, the Chaverim School hosts several community events called Kulanu Yachad, which means "All of us together." Kulanu Yachad events are held on Saturday or Sunday mornings 4 times per year to bring the entire HBT community together in celebration of a holiday or a theme. During these, we run programming designed specifically for children 0-5. In the past, we have had puppet shows by a visiting puppet theater, music services led by local Jewish musicians, and more. See the calendar for dates, and the events page for programming details. Aside from the regular programming of Shakin' Shabbat and Kulanu Yachad, we also hold stand-alone events for our Families with Young Children. Past events have included play dates and a first night seder for young children. Through a partnership with CJP, we have participated in the Seder in a Box program and Shabbat of the Month. Sign up for these programs is through HBT, and is available to members of our FwYC community. Other programming is available directly through the CJP website.